You probably already know that Kauai is filled with one-of-a-kind natural wonders. You could spend a lifetime sampling the island’s treasures and still have more to see. 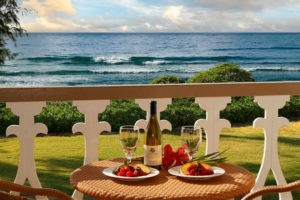 One spot that’s and absolute must for any Kauai vacation, however, is Poipu Beach. 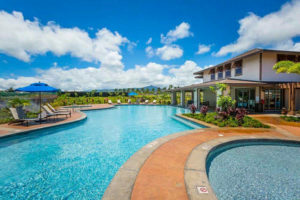 Located a mere 15 miles south of Lihue Airport, it offers more than its share of unsurpassed scenic splendor, with unlimited recreational opportunities for people all ages to enjoy. Poipu Beach is actually two bays divided by a sand bar that extends into the Pacific. This sandbar, or “tombola” in local parlance, is a favorite spot for giant turtles, monk seals, and tropical birds to kick back and enjoy the tropical sun. This makes Poipu Beach perfect for observing a wonderful variety of exotic wildlife. On one side of the tombola is a shallow area protected by lava rock that’s perfect for children and novice swimmers. Other parts of Poipu Beach are best suited to seasoned swimmers. 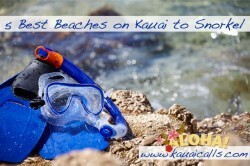 The opportunities for snorkeling are among the best in all of Kauai. Swarms of brightly colored tropical fish are abundant in the warm waters. The Travel Channel recently proclaimed Poipu Beach the number one beach in the United States. Other ratings organizations consistently name it one of the top 10 beaches in the world. With accolades like that, you can see why we recommend it. Adjoining Poipu Beach is Poipu Beach Park, an ideal venue for all sorts of family-friendly pastimes. Picnic tables, grassy fields, and covered shelters offer the perfect settings for fun, healthy activities. The park is also a great place to meet local people and get a feel for authentic Hawaiian culture. Avoid swimming or snorkeling during high surf. Keep an eye on small children at all times while they’re in the water. Only swim in areas where a lifeguard is present. Check the daily surf report before venturing into the water. Avoid venturing out by yourself unless you’re a strong swimmer and used to ocean waters. Keep an eye open for unusually strong ocean waves. They can drag you out into the sea if you’re not careful. Keeping these tips in mind will help you to get the most out of your trip to Kauai. From Lihue airport, turn onto HI-56 S and continue onto HI-50 W. After about three miles turn left onto State Highway 520. Stay on the route as it becomes Maluhia Road. Turn left onto Ala Kinoiki, left again on Poipu Road, then left once more onto Hoowii Road to arrive at the beach. 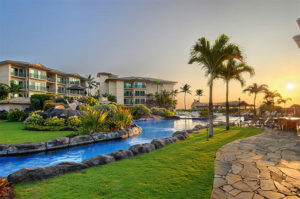 While you’re making your plans to visit Kauai, don’t forget to choose the right lodging. Dirty, crowded hotels and part-time innkeepers can ruin an otherwise perfect getaway. So make the smart choice and stay in one of our professionally managed getaway properties instead. They offer a level of privacy and comfort that others just can’t match. Browse our site and reserve your vacation home today. We’ll see you soon in paradise.